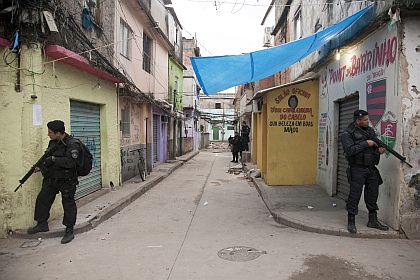 Police patrol Manguinhos favela in Río de Janeiro. Santi Carneri/Demotix. The Confederations Cup, to be held in June across six host cities, comes as a test for Brazil as it braces for a never-before-seen series of mega-events, including the soccer World Cup in 2014 and the summer Olympics in 2016. Among the top concerns for organizers, as is usually the case for major international events, is security, a concern that has been amplified by the country’s high crime rates. Brazil has taken up the challenge with a $900-million investment in security forces from the federal government, as well as a slew of measures, from CCTV cameras to drone monitoring, to the spectacular “pacification” programs run by certain World Cup host cities to clear the favelas from drug gangs. During the Confederations Cup alone, approximately 15,000 private officers will guard the various venues – twice as many are planned for the 2014 World Cup. These mega-events, as well as the security apparatus they imply, come at a time of shift for Brazil in the arena of defense. The country, which seeks to increase its status on the global stage, is also looking at increasing the protection of its borders and natural resources (in particular, its oil reserves, located on the coast of the state of Rio de Janeiro). Brazil has been lobbying for a permanent seat at the UN and has entered a phase of renewal of its military equipment; its president, Dilma Rousseff, has exempted defense companies from taxes for five years, in order to boost national production. Mega-events are clearly a way to showcase the country’s strength and credibility as a major player on the international scene. But using security for image building, as past examples have shown, can be akin to opening Pandora’s box. In Discipline and Punish, Michel Foucault wrote: “our society is one not of spectacle, but of surveillance,” in reference to Guy Debord’s society of the spectacle theory. In recent years, mega-events have blurred the lines between Foucault’s and Debord’s worldview, turning sporting events into showcases of security know-how, and security into a spectacle itself (a phenomenon called “spectacular security” by Canadian sociologists Philip Boyle and Kevin Haggerty.) Mega-events provide host countries and cities with the perfect opportunity to improve their credibility by proving they are in control of their territories. Therefore, the purpose isn’t to ensure security per se but to demonstrate an illusion of security that will reassure mega-event stakeholders. This illusion begins long before the events start, indeed the Brazilian government officials declared last year they were hoping to make the 2014 World Cup “one of the most protected sports events in history”. The willingness to perpetually outdo every previous event in order for host countries or host cities to distinguish themselves from others has led to an escalation in security bills. In the case of Olympic Games, they went from $66.2 million for Barcelona Games in 1992, to $179.6 million in Sydney in 2000, to Beijing’s $6.5 billion in 2008 and London’s $2.2 billion in 2012. This rhetoric has been fuelled by the meteoric growth of the private security industry, one of the fastest-growing industries in the world, spurred itself by the post 9/11 global climate characterized by fear of unpredictable attacks. For these companies, major international events are a godsend – they provide the opportunity to sign huge contracts, showcase their products and knowledge, and establish new standards for urban security that will be replicated around the world. A vast number of companies and consultants now gravitate around the organization of mega-events, helping new host cities and countries learn from “best practices” in the field. Brazil has reportedly taken advice from the Royal Canadian Mountain Police after Canada hosted the Vancouver 2010 winter Olympics, and from Spanish and American trainers, among others. Rio de Janeiro also signed a multi-year consultancy contract with former New York City mayor Rudolph Giuliani to learn from his “broken windows” theory (in spite of having mitigated results in Mexico). But Brazil’s strongest ties with a foreign security industry are with those of Israel. Israeli companies like Elbit Systems, Israeli Aircraft Industries and Israeli Military Industries have been doing business with Brazil for years, while Rafael Advanced Defense Systems has bought a 40% stake in Brazilian GESPI Aeronautics. Back in 2010, Brazil and Israel signed a security cooperation agreement, with news reports stating the agreement dealt specifically with the World Cup and Olympics. Since then, officials from both countries have met to develop partnerships for mega-events and Israeli security experts have given several conferences and workshops for Brazilian officials and members of the Municipal Guard. In late 2012, Brazil’s chief of security for major events said Brazil and Israel were in the process of signing a protocol to share security intelligence. In the recent case of BRIC-hosted mega-events, security concerns have also been inflated by issues of local crime. Many observers have cast doubt over the fact that Brazilian cities, with large parts of their territories under the rule of drug gangs, could successfully host major events, even though Rio de Janeiro has held Carnival and New Year’s festivities for years. Interestingly, local activists don’t worry as much about security during the World Cup or the Olympics as in the aftermath – they fear the city’s commitment to the pacification program might end once the international media’s attention is elsewhere. Another concern is that local police forces are too weak to sustain the burden of securing the events (Brazil’s Military Police is known for being corrupt and its officers underpaid and violent). This has been used as the justification for increasing the role of private security companies.